In most of the branded world (fashion and food especially) being an Italian import is a good thing. Not always so for cars. Case in point: Fiat, a nameplate that never really found a smooth road in America. 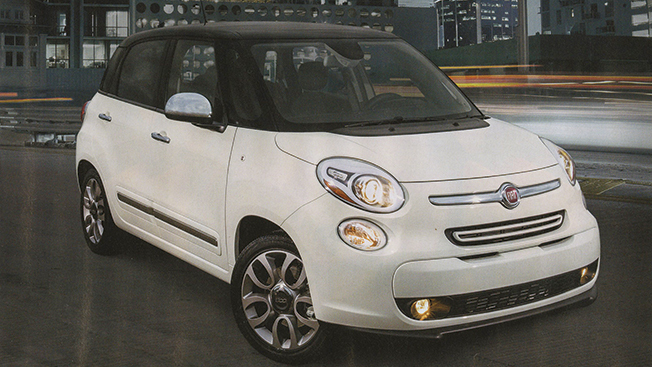 Still, Fiat has its share of fans—drivers lured by the little car’s Italian style. And that’s what makes this pair of ads interesting. While both use the same composition (put cute white car in center of page), only the older ad is proud to be Italian. When this monochromatic ad for the 600D appeared in 1965, Fiat had been in the U.S. market for nine years. Its cars were not lauded for their engineering genius: The tiny 600’s rear-mounted engine meant that the gas tank sat in front of the driver. And with a gallon of regular selling for 31 cents, Americans didn’t really need Fiat’s fuel efficiency, either. But, much like the VW Beetle, Fiat appealed to that segment of American buyers who longed for something that a Plymouth Valiant couldn’t give them—that dash of European flair.